Synthetic peptide within Human Cardiac Troponin I aa 1-100 (N terminal). The exact sequence is proprietary. WB: Human fetal heart tissue lysate. IHC-P: Human heart and Human cardiac muscle tissues. Flow Cyt: A-673 cells. Our Abpromise guarantee covers the use of ab52862 in the following tested applications. WB 1/100000 - 1/1e+006. Detects a band of approximately 28 kDa (predicted molecular weight: 28 kDa). Immunohistochemistry (Formalin/PFA-fixed paraffin-embedded sections) analysis of Human cardiac muscle tissue sections labeling Cardiac Troponin I with Purified ab52862 at 1:300 dilution (1.19 µg/ml). Heat mediated antigen retrieval was performed Perform heat mediated antigen retrieval using ab93684 (Tris/EDTA buffer, pH 9.0). ImmunoHistoProbe one step HRP Polymer (ready to use)was used as the secondary antibody. Negative control:PBS instead of the primary antibody. Hematoxylin was used as a counterstain. ab52862 (purified) at 1:30 dilution (2µg) immunoprecipitating Cardiac Troponin I in Human fetal heart lysate. IHC image of Cardiac Troponin I staining in human heart formalin fixed paraffin embedded tissue section, performed on a Leica Bond system using the standard protocol F. The section was pre-treated using heat mediated antigen retrieval with sodium citrate buffer (pH6, epitope retrieval solution 1) for 20 mins. The section was then incubated with ab52862, 1/200 dilution, for 15 mins at room temperature and detected using an HRP conjugated compact polymer system. DAB was used as the chromogen. The section was then counterstained with haematoxylin and mounted with DPX. Flow cytometry analysis of A-673 (Human muscle Ewing's Sarcoma ) cells labeling Cardiac Troponin I (red) with ab52862 at a 1/30 dilution. Cells were fixed with 4% paraformaldehyde and permeabilized with 90% methanol. A goat anti-rabbit IgG (Alexa Fluor® 488) (ab150077) was used as the secondary antibody at a 1/2000 dilution. Black - Rabbit monoclonal IgG (Black) (ab172730). 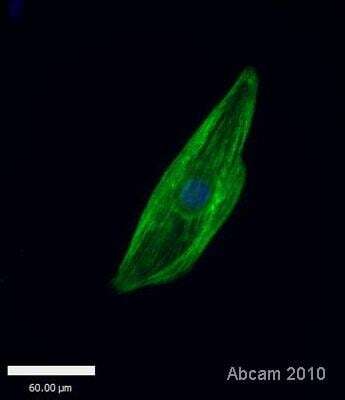 Blue (unlabeled control) - Cell without incubation with primary antibody and secondary antibody (Blue). ab52862 at 1/250 dilution staining cardiac Troponin I in human cardiac muscle by Immunohistochemistry, Paraffin embedded tissue. Publishing research using ab52862? Please let us know so that we can cite the reference in this datasheet. I recently acquired Epitomics´ Rabbit mAB against cardiac troponin I (EP1106Y - 100 microL - lot GR36789-4 from Abcam). I am using the antibody as a capture Ab on Dynal magnetic beads and for the coupling reaction am interested in knowing the protein concentration of the antibody. Can you supply me with this information or, alternatively a coupling protocol that you may be using for tosyl activated Dynal beads (all sizes). The concentration of Rabbit mAB against cardiac troponin I (EP1106Y - 100 microL - lot GR36789-4) is xxxxxxxx mg/ml. I passed your details on tomy colleagues at Epitomics who will contact you regarding your request. Could you provide me with the concentration of one of your products? 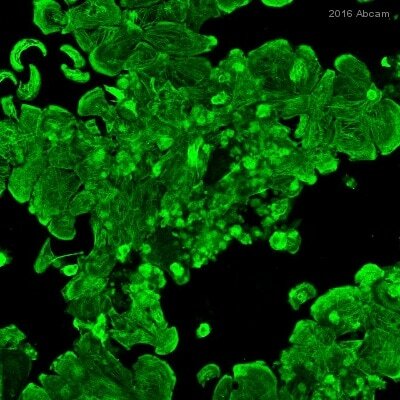 I can confirm that ab52862 antibody is sold as tissue culture supernatant. Unpurified antibodies, such as those sold as whole antiserum, ascites or tissue culture supernatant will not have a concentration stated on the datasheet. Antibody concentration is usually determined by protein assay, and serum / ascites / tissue culture supernatant will contain a lot of other proteins, which means the antibody quantification would not be accurate. I can confirm that for tissue culture supernatant, concentration of antibody is known to very between 1 - 3 mg/ml, however this conc is not the specific IgG present in solution. I am very pleased to hear you would like to accept our offer and test ab52862 in Flow Cytometry. This code will give you 1 freeprimary antibodybefore the expiration date. To redeem this offer, please submit an Abreview forFlow Cytometryand include this code in the “Additional Comments” section so we know the Abreview is for this promotion. For more information on how to submit an Abreview, please visit the site: https://www.abcam.com/Abreviews. Hello, Thank´s for your quick answer. The monoclonal isotype control you mentioned (ab99234) is it going to be available in your catalogue later on? It might not be worth ordering that particular control if I won´t be able to order and use it again. In what volume and concentration is the control and what´s the current price? Thank you for your reply. I am currently in contact with the source of this monoclonal isotype control antibody as due to licensing issues it indeed seems difficult to get it, and I am awaiting a reply. I will forward to you the information as soon as I receive it. In the meantime, following the explanation given in my last mail I could recommend polyclonal isotype controls such as ab27478 or ab37415, depending on the application you would like to perform. Click here (or use the following: https://www.abcam.com/index.html?datasheet=27478). Click here (or use the following: https://www.abcam.com/index.html?datasheet=37415). Also, in case you would like to use the isotype control for flow cytometric experiments: Isotype control antibodies are of different clones than the primary antibody of interest and therefore may show varying binding properties compared to the specific antibody of interest. Furthermore, as the conjugation conditions may have been different, the labeling with the fluorochrome can vary which can be a very important issue in flow cytometry. Although isotype controls are frequently used in flow cytometry experiments, it is not the only type of control to determine non-specific binding and positivity for the marker of interest. This control is termed fluorescence minus one or FMO and works like an isotype control without the actual antibody. FMO controls are set up by leaving out one of the antibodies in your staining panel. This control might be also an option for your experiments and you may find more information about this type of control in the latest publications or on flow cytometry websites, such as http://www.isac-net.org or http://www.cyto.purdue.edu/ . If all of this is no option for you and you need the isotype control soon, I would like to recommend checking the Biocompare website which has an excellent antibody search facility that includes many suppliers. The links are: www.biocompare.com or http://www.biocompare.com/ProductCategories/2045/Antibodies.html I am sorry for the confusion and hope this information is nevertheless helpful to you. Please do not hesitate to contact me if you have any further questions in this regard. Hello, I´m using Abcam´s rabbit monoclonal cardiac Troponin I antibody (EP1106Y) for my studies. I´m now looking for a proper isotype control and are uncertain whether I can use your polyclonal rabbit IgG isotype control or if I should try to find a monoclonal control instead? Thank you for your enquiry. If you have a polyclonal rabbit IgG isotype control already at hand, you could use it for this rabbit monoclonal, as amongst other isotypes it may also include the isotype of the monoclonal antibody and therefore resembles some kine of isotype control. Having said this however, I am happy to let you know that we have a rabbit IgG monoclonal isotype control in our catalog (see attached and ab99234: Click here (or use the following: https://www.abcam.com/index.html?datasheet=99234).) We currently do not have it in stock, but I am more than happy to arrange a delivery for you if you are interested. I hope this information is helpful to you. Please do not hesitate to contact us if you need any more advice or information.